Best Menu Competition entrant: “We aim to be as vegetarian friendly as a barbecue joint can be with smoked tofu”. Cross Ties Barbecue. I described the first day of my recent adventure in The Summons. So what went on the following day? When i woke up, Mark and Stephanie were already hard at work in the kitchen. I suggested that i could help by picking out the crabs, and they put out in the center of the work island a large, 1/2″ thick plastic slab to work on. Stephanie had not done this before, so she got on the other side of the island. I demonstrated how to open the crab and warned that all the delicious green tomalley displayed inside the shell when you break the crab open should not be eaten because of a high level of dangerous toxins concentrated this year in that digestive organ. How did she do? you wondered. Well, i had a quarter of my crab picked out before she really got started, but somehow she managed to catch up and we finished the first one simultaneously. She did the next two while i was doing one. Hmmm, young people with their advanced motor skills. The rest of the day was a blur, and i spent much of the morning helping with prep work like mashing pureed raspberries through a chinois to achieve a velvety texture. FYI, in French that would be much more simply, “Jai chinoisé les framboises.” English really needs a word meaning “mash something through a very fine strainer to achieve a velvety texture”. Anyhow, there was an early lunch break to a pie place that rocketed above my highest expectations. Superb chicken salad and sublime chocolate cream pie. Better than the one made by the previous dessert chef at the Mission Beach Cafe in San Francisco. That good. The coastal elites may call this flyover country, but they’ve not eaten at A Slice of Pie. Even though they don’t take credit cards, they would be a great success in San Francisco’s viciously competitive restaurant scene. After lunch i did more prep work and then helped set the table for 11. Then the guests arrived and we all went out onto the croquet court. Some of the intrepid young ones began playing, led by Mark, even though none of them showed Mark’s familiarity with the course, it not being a rolled lawn. Actually, we were not really out there to play croquet, at least most of us, for it was there that the first course was served. One note: the links i provide below are my guesses as to where they got their recipes…or parts of recipes. This crab cake recipe makes cakes as good as i’ve ever had anywhere. Ummm, the chefs may have had something to do with that, too. I’d never had this combination, and OMG, did the crab and pistou go well in the soup, setting each other off. Thanks to having a Malaysian Chinese friend, i was familiar with gochujang, but i’d never had black rice before and just loved it. Nectarines are my favorite fruit, but i’d never caramelized them, and i’d certainly never dreamed of adding them to a creamy risotto. Oh wow. Yet another marvelous combination, and this time i went Googling around for quite some time looking for a recipe they might have used. Clearly in this case they drew on at least two recipes, but whatever they used, the dish turned out spectacular. Oh my goodness, we know how well fruit accompanies pork , but i’d never have thought of using an avocado along with orange segments…and searing them both. I’d fried potatoes in lard and duck fat, but never in beef tallow. Will now. And what a fine course this was. The cheeses were Agour Ossau-Iraty AOP – Aged Six Months, Blu 61 by La Casearia Carpenedo, Fiscalini Bandage-Wrapped Raw-Milk Cheddar, Parrano, and Petit Sapin – Vacherin Mont d’Or Type. At this point in the dinner, my taste buds had been under attack for so long that it was no surprise that the winner was the strongest cheese, that blue. I knew ahead of time that this dessert would be fabulous, but only while i was eating it did i realize that serving a flavorful but light dessert would be, after a 7 course dinner, perfection. 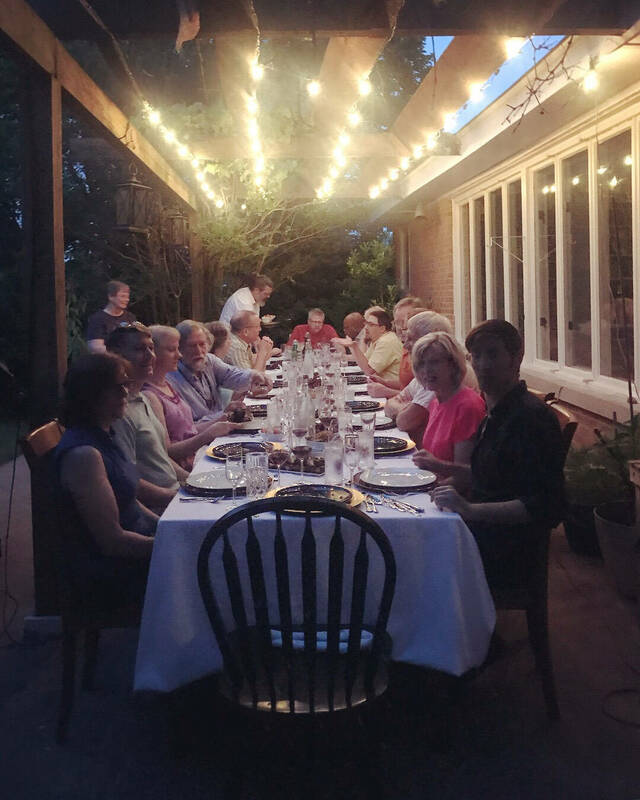 Speaking of perfection, one of the guests, a physicist named Gerry Wilemski, provided a perfect barrage of excellent wines throughout the meal. This was the finest meal i’ve ever eaten in a private home, and it vies with favorite meals i’ve had at the restaurants of internationally acclaimed chefs. Afterwards, i staggered off to bed, fully intending to get up in the morning and help Mark and Stephanie with the cleanup. Alas, i was rudely awakened by Jim with the news that i needed to get moving if i were going to catch the last car to St. Louis. Yes, the previous day had been such an overload in both physical activity and gorging on the finest dinner i’ve ever eaten that i had hit the ten hour mark and was going strong when Jim interrupted. My return flight was uneventful, the way i like them, but there’s more to this story, so stay tuned. It was a stunning experience, for sure. Thirty years ago i was throwing multi-course dinners for as many as a dozen people, but neither as many courses nor as elaborate.